The purpose of the present study was to determine whether expected changes in body weight via a three day low-carbohydrate (CHO) diet will disrupt the reliability of air displacement plethysmography measurements via BOD POD. Twenty-four subjects recorded their typical diets for three days prior to BOD POD and seven-site skinfold analyses. Subjects were matched for lean body mass and divided into low-CHO (LC) and control (CON) groups. The LC group was given instruction intended to prevent over 50 grams/day of carbohydrate consumption for three consecutive days, while the CON group replicated their previously recorded diet. Body composition measurements were repeated post-dietary intervention. Test -retest reliability measures were significant (p < 0.01) and high for body fat percentage in both the LC and CON groups (r = 0.993, 0.965, respectively). Likewise, skinfold analysis for body fat percentage reliability was high in both groups (r = 0.996, 0.997, respectively). There were significant differences between first and second BOD POD measurements for body mass (72.9 ± 13.3 vs. 72.1 ± 13.0 kg) and body volume (69.0 ± 12.7 to 68.1 ± 12.2 L) in the LC group (p < 0.05). 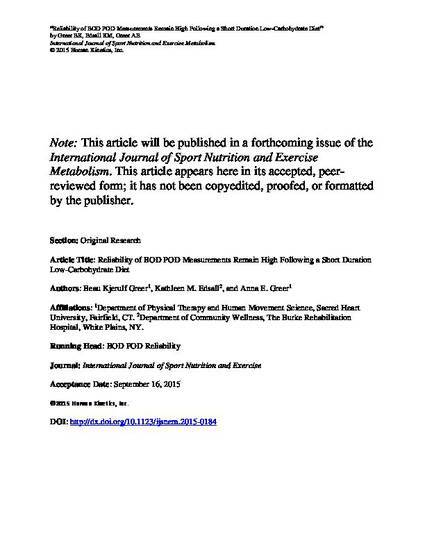 However, there were no differences (p > 0.05) in BOD POD-determined body fat percentage, lean body mass, or fat mass between the first and second trial in either groups. Body composition measures via BOD POD and seven-site skinfolds remain reliable after three days of a LC diet despite significant decreases in body mass. Version posted here: This article appears here in its accepted, peer reviewed form; it has not been copyedited, proofed, or formatted by the publisher.